After you meet with your care team provider, you will receive an email from StriveHub Portal, or a print out in the clinic, with information regarding your new StriveHub Portal account and your Access Code. 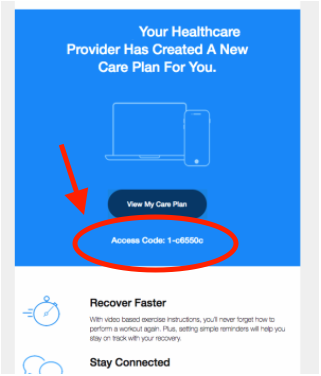 An Access Code is a one-time use, patient specific, set of letters/numbers that sync up with your records at your healthcare provider for additional security. The only time you will be asked for your Access Code is during your initial StriveHub Portal account setup process. Be sure to include no additional spaces either before or after your Access Code when you are prompted for it.